About 10 years ago, I met my husband Jeff at a party I almost didn’t go to (but obviously glad I did). At the time, I worked at a nonprofit as an event planner while Jeff was finishing up his PhD in Electrical Engineering. During our free time, we would meet up for dinners in downtown Greenville, South Carolina at Barley’s Taproom, Sassafras Bistro and Coffee Underground, then go for walks around Reedy River Falls. We also hiked at Paris Mountain State Park and Jones Gap, fed the ducks at Furman University and took daytrips to Asheville, North Carolina. A few months later, we moved to Boston together and, since then, he’s enriched my life in countless ways. Most notably, I love Jeff’s sense of unconditional kindness, ability to laugh at any situation and the way he brings perspective and balance into my life. I love his Jack Donaghy and Jason Bourne impressions, how he can read a book for hours on end, and think it’s endearing that he finds Gold Rush and Storage Wars such interesting shows to watch. I always love seeing him grab his camera to go outside to take a picture just because the light in the sky is perfect or the snow has fallen a certain way on the wrought-iron railing on our front porch and that he sees and wants to capture the beauty in everything. It inspires me, expands my realm of thinking and opens up a part of the world I don’t often think about or appreciate as much as I should. So for this Valentine’s Day, I can’t help but gush about why I feel so lucky to be married to someone who is so endlessly kind, deeply intelligent and irreverently funny. 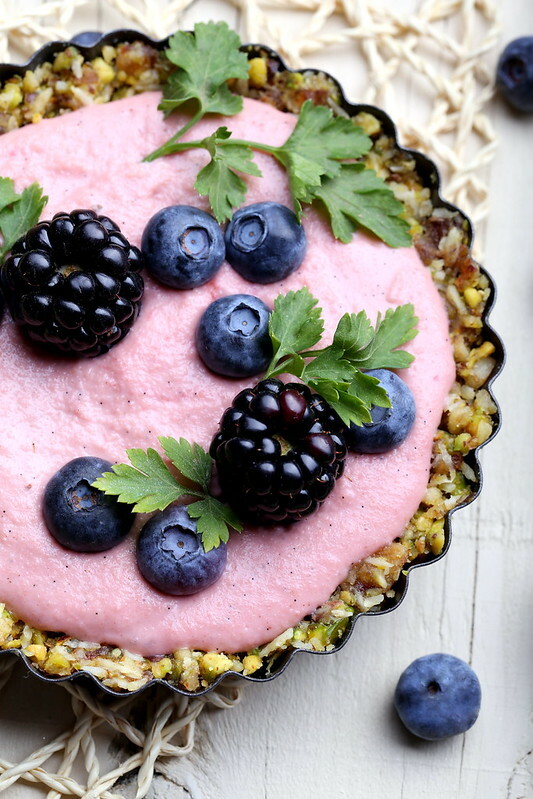 Can I also make the comparison that this tart is kind of like him: sturdy and sweet on the outside, and soft on the inside … without sounding corny? Too bad! Happy Valentine’s Day Jeff. I love you. Blend the cashews and coconut milk together by using a blender or an immersion blender. Once the mixture is very smooth, add in the agave, vanilla, fleur de sel and blend again. Add in the beet powder or juice, 1 tsp at a time, until the desired color is achieved. Place into the refrigerator to chill. First place the chopped dates into a bowl of warm water and set aside.Place the raw pistachios into a small food processor and chop until coarse, taking care not to pulverize into a powder. Transfer to a medium-sized bowl. Do the same for the raw walnuts. Drain the dates and finely chop, then add to the bowl, then add the shredded coconut to the bowl and manually stir until well combined.Drizzle the coconut oil over the top and stir. Add in the liquid lecithin and stir again. Sprinkle with the fluer de sel, stir again, then cover and place in the refrigerator to chill and firm up. Divide the crust mixture into 6 parts, then press each section into 4 3/4-inch tart pans. 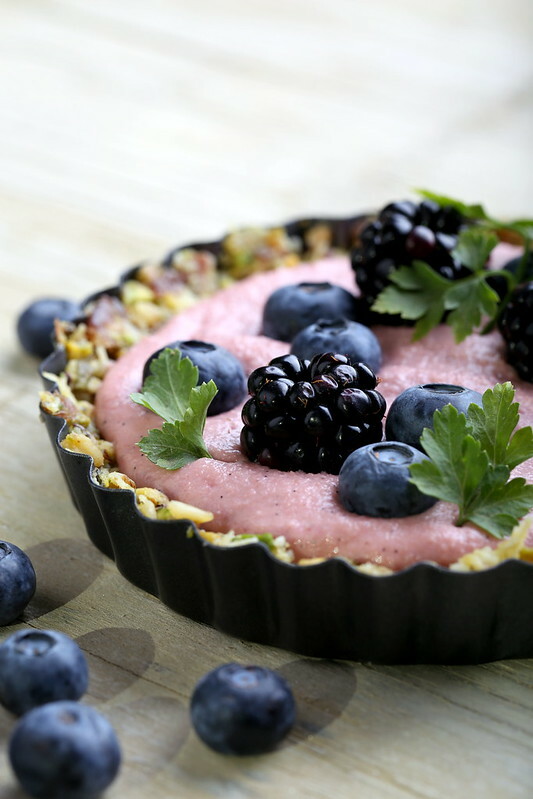 Spoon the filling over the top, place in the refrigerator to chill and slightly set for an hour or so, then and garnish with fresh berries and a little extra fleur de sel as desired and serve. Thanks Caitlin! The Culinary Coconut Milk is really fantastic — it's very, very thick and doesn't separate at all. It seems like a great product! this is just so incredibly sweet. sniffle. aw, thanks Lan! I felt a little goopy writing it, but it's all true!! 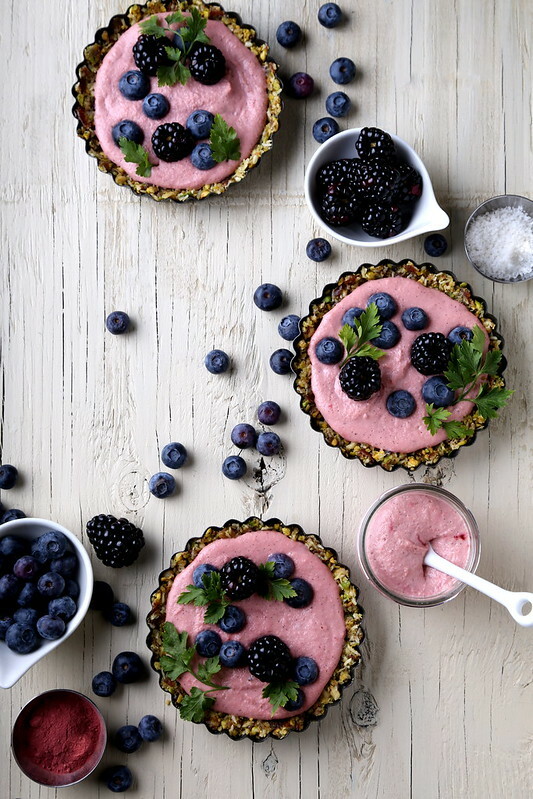 Those tarts look amazing! I'm just wondering if it still works to substitute something else for the walnuts? I think any other kind of raw nut would work here in place of the walnut. P.S. A quarter of what for the coconut oil in the crust? oops! A cup — I've updated that info above. Thanks very much, I can't wait to try this! You had me at "Delicious" !!! Can't wait to try all the beautifully depicted, healthy dishes you have so thoughtfully created! Omg, I love this yummi receipe! Such a great idea, thanks for sharing!